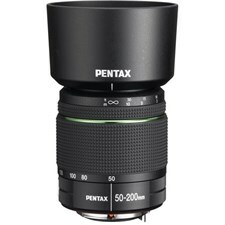 The SMC Pentax DA 50-200mm f/4-5.6 ED WR Lens is a medium-range 4X telephoto zoom, designed for exclusive use with PENTAX KAF-mount digital SLR cameras. This DA 50-200mm zoom features a responsive "Quick-Shift Focus System" that allows photographers to instantly switch the focus mode from auto to manual with a slight twist of the focus ring. This lens boasts a simple, functional design, is weather sealed plus has a SP (Super Protect) coating to keep the lens free of grease, dust and other elements which could impact lens function and image quality. This lens also features an Extra-low Dispersion (ED) glass lens element and two aspherical lens elements for true-to-life image reproduction and overall size reduction. The image circle in DA-series lenses is designed to perfectly match the 23.5 x 15.7mm size of the CCD used in PENTAX digital SLRs to optimize camera performance.